Do we really need the Windows Start button? The release of the Windows 8 beta is approaching and some of its changes are starting to emerge. One in particular has stirred up Windows fans – scrapping the Start button. Could you live without it? The Start button is more than just a feature of Microsoft’s operating system, it’s an insignia of Windows. Giving it up is proving hard for many, as this iconic button has been a part of Windows for 17 years. Updating software, especially if it’s as well sold as Microsoft’s operating system, always represents a challenge for programmers as they need to approach the problem with two conflicting viewpoints. First, they need to be innovative and create the next big thing. But, secondly, they must preserve the identity of the company and retain what’s worked in previous versions. However, Microsoft has the upper hand with Windows 8 as it’s combining the great bits from Windows 7 with the best of its mobile operating system, Windows Phone 7. Having played with the developers’ version of Windows 8, I can see why Microsoft has scrapped the Start button, since the way you navigate through programs and settings has completely changed. The new GUI (graphical user interface) lays out the programs on tiles that you can personalize, with a gear icon that lets you access the system settings. Leaving the Start button on this new interface (it’s actually included in the developers’ version of Windows 8, but missing from the ‘Consumer Preview) would be like having Windows 7 running alongside Windows 8 just for the sake of it. Having said that, I think Microsoft should definitely consider giving the option for users to have a more ‘standard’ layout for those who struggle to transition from one operating system to another. I personally like the experience of upgrading to a new operating system. And even though I might struggle for a couple of days as I try to find my way around the new GUI, many of the changes make my day-to-day work more efficient. Finding that balance will be the key to Windows 8 being a successful release for Microsoft. As for the iconic Windows Start button, I won’t miss it, will you? 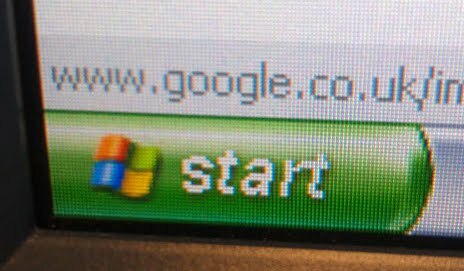 The Start button used to be the one to click to shut down a PC. Do you still click Start to stop? I do – it gives access to a sideways menu that includes ‘Shut Down’. It’s quicker to use the keyboard key though. I plod along with Vista [yes, I know . . . Windows 7 hadn’t been launched when I had to replace my previous machine]. I quite like Vista now I’ve got used to it. I echo Bluestocking’s comments on the Ribbon menu for Word though – the categorisation of the commands is often illogical although it has much greater functionality overrall. Luckily I only have to use a small proportion of its features access to which I have now learnt [although some still take two attempts!]. Thanks John. I have used Vista and W7, but mainly on networked machines where shutdown is handled very differently. My comment was slightly provocative and I poke fun at Apple for their time honoured way of dragging icons into the bin to unmount external storage devices. At least the bin symbol changes nowadays, and modern Mac keyboards have a key for this purpose. I prefer the ribbon interface on Microsoft Office, mainly because students find this much more intuitive for a few tasks, especially drawing scientific graphs in Excel. The ribbon interface has finally made an appearance in Office 2011 for the Mac, but interestingly this also provides the old File, Edit, etc menus. I admire your persistence with Vista and from my limited experience I think you will be in for a pleasant surprise if you migrate to W7, which should really have been released as a free upgrade. As long as Microsoft and Apple continue to copy each other for the benefit of all computer users I can cope with Start buttons and other idiosyncrasies. The Start button is not merely an icon (in either sense of the word). It is the cornerstone of the Windows environment. Try telling someone over the phone how to start a program without it. Will you know how to get them to find it? If you use someone else’s PC, will you be able to find things? If you want to actually perform a Search operation on the computer, will you know how? Even if you do, will it be as simple as Start button then type? Once upon a time, Windows was all about choices. There were many ways to achieve the same task, and you chose the method that you found most comfortable or quickest etc. The ribbon destroyed that in Microsoft Office (impossible to argue against, that one) and the removal of the Start button will achieve a similar result in Windows 8. Fortunately, if I am force to use Windows 8 (and I doubt that I will be), there will be countless third-party developers who will compensate for and reverse this removal be replacing or even improving on this tried and trusted core Windows feature. I’ve upgraded through and enjoyed every Windows iteration since 3.1 (even Vista 64-bit which was stable if a bit naggy) and can see myself remaining a loyal Windows 7 user for the foreseeable future. Windows 8 may be great for tablets (MAY be…) but the focus is so far from the desktop, I really don’t see it as viable for that platform. I am not sure about that. Keyboard shortcuts still worked when I last used the PC version of Office. I feel that Microsoft are not taking in account the aging, and fairly computer experienced older users. It is more difficult to change to new layout and operation when in your 70’s and 80’s. I really feel that a backwards USEAGE path is essential to keep all users happy. The excellent Classic Shell should be a part of W8. Microsoft have plainly got it wrong again. They should try employing or at least market testing on a greater age range of possible end users. The biggest gripe I hear in the work environment (not much use shouting obsenities in the quiet of your own home) is, repeatedly, “why did they change the ……. button that was so easy to use and now make things so much more complicated”. The reference is to earlier tried and understood ways of handling documents, cells, etc., etc., I, myself, suffer too, but in silence. Software developers, please don’t change things unless you really have to. It seems they change things just for the sake of change.